Add a gorgeous pop of color to your ensemble with this perfect pendant necklace and earring set from Kitsch. This necklace and earring set is made of 14k gold plated brass, and beautiful pave cubic zirconia. The Stationary Pendant is a beautiful, vibrant color and is sure to attract tons of compliments. 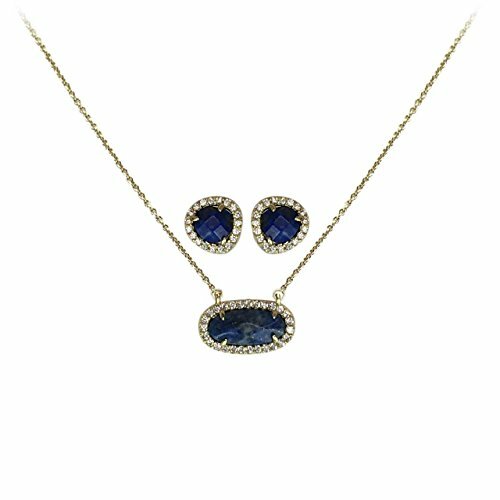 14K Gold Plated Sterling Brass Pendant Necklace and Earring Set. Wears beautifully together or separately. Made up of semi-precious stones that when worn are said to intensify and balance certain characteristics you wish to attract into your life. If you have any questions about this product by Kitsch, contact us by completing and submitting the form below. If you are looking for a specif part number, please include it with your message.